Partick Thistle kick off their Scottish Cup campaign on Friday night with the short trip to Paisley to face St Mirren. The Buddies have struggled in the Championship since last season’s relegation but Jags boss Alan Archibald will take nothing for granted as Saints try to impress new boss Alex Rae. Thistle and Saints haven’t met in the Scottish Cup since 1989 when Jags won a third round replay 3-1 at Love Street after a goalless draw at Firhill. They did however meet in last season’s League Cup, Thistle winning 1-0 at Firhill after extra-time. Alan Archibald’s side go into the tie on fine run of form despite the end of their six-game unbeaten run in agonising fashion at Celtic Park. Jags were within touching distance of following their midweek goalless draw at second-placed Aberdeen with a repeat at leaders Celtic when Leigh Griffiths struck for the home side. However Thistle defender Callum Booth says Jags are determined to put that disappointment behind them when they take on St Mirren. He told the club website: “We are all looking forward to the game. The Scottish Cup is always a day players and fans alike look forward to and hopefully there will be a big crowd with it being just along the road too. 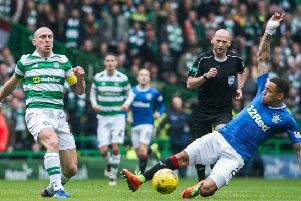 “We were absolutely devastated after the game on Saturday, I think there was a real belief that we could win the match, especially as the game wore on and they were then reduced to ten men. We were playing well and for that to happen so late was obviously massively disappointing. Having said that, it’s been a good couple of months for us and we picked up a good point in Aberdeen the week before after a great performance so we are all still feeling confident and will keep taking the positives as we head into the match with St Mirren. One player who won’t be involved is striker Robbie Muirhead who has returned to Dundee United following his loan spell at Maryhill. The 19-year-old made eight appearances for Thistle, netting twice with both coming in the 5-2 win at Kilmarnock in November. However two more strikers are back at Firhill, having completed loan spells elsewhere. Jordan Leyden (19) has rejoined the Jags squad after a short loan spell with East Fife during which he made three appearances for the League Two side. And Chris Duggan has also arrived back at Firhill having completed his second loan spell at Queen’s Park. The 21-year-old Australian made 19 appearances for the Spiders netting four goals. Defender Michael McMullan has joined League Two side East Stirlingshire on a development loan until the end of the season which means he remains eligible for Thistle’s Development League side.